I’m 8 years old. I’m in the bathroom, just out of the shower, hair still wet. A look in the mirror, bath towel in my hand. It was baby blue, I remember. I look at myself while I wrap the towel around me like a strapless gown, with a knot in front. Queen of the bathroom. I smile. I come to life. I’m 15 years old. A friend of a friend has to do a cabaret performance for school. He tells me about the struggle of finding heels in his size. I ask him what size he has, a EU45 he says. My shoe size. He encourages me to try them on. I hesitate, but my excitment wins from every other voice in my head.The heels were a patent leather peeptoe, I remember. My walk through the room is not even half as instable as I thought it would be. I have never felt more confident in my life. I’m 17 years old. For a while, I have been thinking of doing something with make-up on my blog but I haven’t had the courage to actually do it. Finally, I message one of my school friends. I ask her if she wants to do my face, and take pictures of me. I don’t really tell her what they are for, but she says yes nonetheless, bless her. Eventually, that blog post will end up changing my life. After the shoot, there’s one more thing I want to ask; would she maybe want to paint my nails? I show her the colour I want. It’s baby blue. On my way home, all I can stare at are my nails, my nails painted in that gorgeous shade of blue the sky gets when the sun almost sets. I smile. Flash forward to June 2018, I’m almost 21 now, living my best queer life. A notification pops up, Troye Sivan just released the official music video for his song ‘Bloom’. The thumbnail by itself is enough to make my heart jump out of my chest. Troye is wearing red lipstick, a white shirt casually draped over his upper body, piercing blue eyes to the camera. All throughout the video I am beaten speechless by every new look, every next setting, every extra shot. 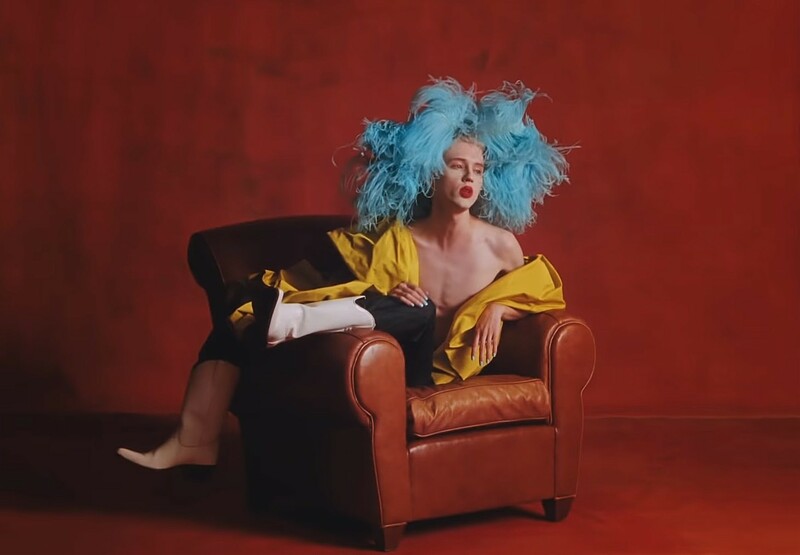 Troye changes between sporting feathers, latex, a white tanktop, a pinstripe suit and, my personal favourite, a floral two-piece with a dramatic floor length skirt and, at the end, a matching balaclava to cover his face.With every look his make-up changes, down to the polish on his nails. I smile. I’m tongue-tied. When the video is over, I find myself at a loss for words. What I just felt through this video is the same feeling I had wearing that towel as a dress, or heels for the first time, or nail polish. It’s exhilarating. It’s gratitude, it’s pride. Look how far we have come. How I wish my younger self could have seen this. How I wish he would’ve had someone like Troye to look up to, and know that it is okay to be unapologetically you, and more, that people can and will adore you for it. To see queer people thrive, to see them live their life to the fullest and make art the way they want to and be succesful is an absolute blessing. Having that queer femme energy out there in the world for everyone to see… it’s incredibly valuable, necessary and gorgeous. Representation matters. Seeing yourself in mainstream media is an affirmation of your identity, of your existence. I think about all the young queer femme boys out there, who, just like me then, are confused, scared or ashamed. Confused about who they are, what their place is in this world. Scared of what people might think. Too ashamed to be who they really want to be. And then, I smile. Because I know that they have a chance of seeing this video. They might see it and feel reassured. This music video is a hug, a hand on your shoulder that says it is okay. Okay to be different, queer, femme, flamboyant. This music video shows that your quirks can become your power. That’s the real power of representation. I smile, and all I can think of is wrapping myself in a baby blue towel, painting my nails and dancing to ‘Bloom’ in the bathroom. Without fear, and full of love. Thank you, Troye.